Refreshingly simple janitorial inspection software. OrangeQC empowers your team to own quality control. OrangeQC unites teams big and small with simple quality control solutions. Our simple, powerful janitorial inspection app and website help your team do quality control right. Whether you’re managing an airport, school, or hospital, OrangeQC lets you customize our tools to fit your needs. When inspections are easy to do, they actually get done. Create your own forms that your team can fill out from any mobile device. 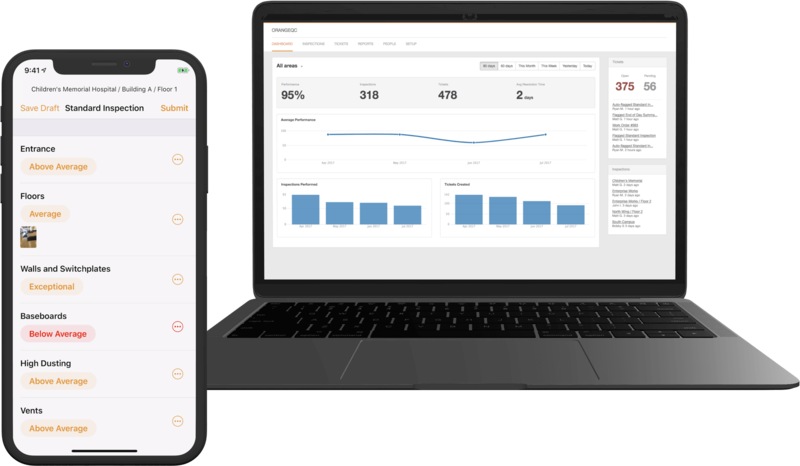 OrangeQC uploads inspections, work orders, and tickets in real time—and keeps everything organized so your team can stay on top of it all. BSCs use OrangeQC to help their teams juggle quality control, work orders, and tickets across multiple buildings and accounts. Cleanliness counts in healthcare like nowhere else. Our powerful quality control tools help your team ensure everything is spotless—and leaves a full online audit trail to back you up. Universities use OrangeQC to help with classroom management, building cleaning, maintenance, and more. It’s an easy way to keep in touch with your team and let them know exactly what needs to be done. Last Chance to Catch OrangeQC at ISSA 2018 – Booth 3553!